With a Royal Caribbean Alaska cruise you can pick either a 14-night round trip excursion or a one-way 7-night adventure. Both types boast days in towns along the route, like Skagway and Juneau, and plenty of time at sea to take in the sights. Princess Cruises to Alaska and the Voyage of the Glaciers Tour features sailing through Glacier Bay National Park and the College Fjord. Get up close and personal with the majestic glaciers as you sail the crystal clear waters on your way to stops in the towns along the route. Princess gets you closer to the coastline than any other liner on this voyage, making it a great choice for the entire family. 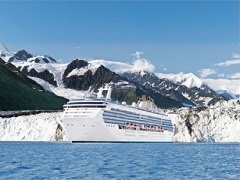 Celebrity Cruises 7-night round-trip Alaska getaway features cruising on the highest rated cruise line in the world. The spa, the fine dining and the attention to detail make this a premium experience for the whole family. With activities for all ages, this cruise to Alaska will never leave you wanting for anything. A Holland America 7-night cruise via the Tracy Arm Fjord will bring breathtaking views right to your window. With stops in tourist friendly towns along the way, this is a cheaper version than the 14-day cruise offered, but still has all the perks from a great cruise line while fitting in all the ‘must see’ aspects of an Alaskan cruise. A Disney Alaska cruise will certainly not disappoint. All that is Disney is on this liner. It is kid friendly, and features deck shows, character shows, Disney themed everything and great food for a family friendly adventure. They even feature the only at sea firework display. Think Disneyland but on the water and you have, in a nutshell what this cruise to Alaska will offer you and your family. A Carnival cruise to Alaska offers a 7-night roundtrip where you cruise the Fjord, marvel at the glaciers and still get to spend time in 4 towns along the route. Enjoy all that is Alaska, the friendly people, the amazing scenery and the charming hospitality aboard Carnival. Norwegian cruise lines are the freestyle cruise leaders. Enjoy a 7-night northbound trip from Vancouver to Alaska, checking out Sawyer glacier and the Fjord as you go. It is your vacation, and they allow you to call the shots while enjoying the scenery and ambiance both onboard and off. Tons of kid-friendly activities make Norwegian a great choice for travelling with a family. Of course, these are just a sampling of the great Alaska cruises from Vancouver that are offered. Cheap Alaska cruises can be easily found by checking online and in ads. Finding the right Alaska Cruises from Vancouver for you and your family will make all the difference in your next cruise vacation.